Bhavya Doshi from Std. IV A participated in Indian Bow held at Karnala Sports Academy in January, 2019. 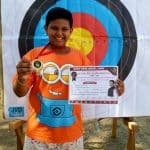 Bhavya won 3 Gold medals in boys U/10 category. He won one Gold medal for 10 mtrs small phase and the second one for 10 mtrs big phase and the last Gold medal for his overall performance.